Everyone (who is alive) has a next big thing. No matter what name we give it, there is a hope in us that sustains us through the everyday grind. It could be an item on a bucket list, a wish list, a guest list, a life goal list, a to-do list, a DIY list, and quite possibly even a $@#% list. Whatever we perceive this list to be tied to, it is really simply a list of hope. A dream is a hope defined. Since I have finally let go of that dream to marry Donny Osmond, most of my hopes/dreams are somewhat attainable. With a little work, and varying degrees of money. Oh yes, and that little issue of my selfish children not giving me grandkids…but I’m not giving up on that dream just yet. Ahem, back to my next big thing. I have achieved quite a few of my life goals. A successful career, a nice home, both kids through college (almost), and I actually own my car. Then illness hit, and suddenly my little train chugging along the life goal list was derailed. The next big thing was to just stay alive. Just to go to the doctor and have my test results come back with indication that I can go on. And I was blessed enough to have that happen. Let me take a moment here to say once again, Thank you for that God. Now that I am stable and I have happily entered back into the human race, I don’t know where to begin. Can’t pick up where I left off, there is too much permanent damage to go back into the work force, and I am finally at peace with that. Let me stop here for a second and describe the personality types in my home. We are A’s and AA’s, like energizer bunny batteries. Once in a while, one or both of us (God forbid) will move into the AAA zone, and an intervention is required to get us over our busy little selves. So after a year of getting my strength back by putzing around the yard, the house, and the neighborhood (Mrs. Kravitz style), it’s time to get a little bigger. The next big thing. The hope sustaining the daily grind. I take out my bucket list and narrow my options. It has to be cheap, I’m trying to live on a shoe string. Off goes Tahiti and pretty much all foreign travel (for now). It has to be doing something I adore, or I will lose enthusiasm over time. That eliminates anything not having to do with being on or near the ocean. Ah yes…that did it. The next big thing on my bucket list just bubbled up to the top. 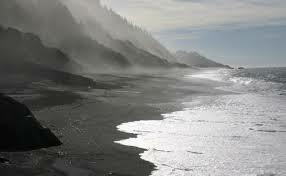 HIKE THE LOST COAST TRAIL. That’s big! That’s very big! It’s the California (my state) coast the way it was before abundantly rich people came and made it unattainable for the other 99% of the state’s population. It’s where the California Redwoods meet the ocean. It’s where seals and tide pools reside without fear of being molested by us human interlopers. So many of my favorite things in one place. I give myself a year to get ready. One year from September 2, 2014. It’s on the 2015 calendar in pen. Check. I do a little research and come upon my first rub…”must have a bear container”. I don’t even know what that is, but I already don’t like it. I have camped once in my life, that was in Yosemite and I was so terrorized by bears I have not camped in the 30 years since. Ok once, but it was car camping and a bear would have had to successfully navigate LA to get to me. Let me add I was a diva the entire time. The heaviest thing I had to carry was my purse from the car to the tent. Bears are a definite concern which means I will have to drag my fearless husband with me, so that goes on the to-do list. Convince husband…check. Not going to be easy but I have a year. Or get a very large dog. I’ll leave that option open. Next item on the list is to get in shape to hike over hill, dale, and sand. I have been walking up to 5 miles 3 or 4 times a week, so I will just slowly up my game and incorporate hiking and sand walking in the mix. Check. Next item up for research is equipment. Ah…another rub. Did I say cheap? Whew, I never knew how much a stinking backpack would cost ‘til I looked online. Holy cow, I don’t want to summit Everest here, just a 3 day jaunt over some rugged terrain. I’m a little mad about it but no matter, I have a year to pinch pennies and make this happen. You see here? See how optimistic and forward thinking I am? This is what the next big thing is about. Hope. Here’s hoping I can get all this together in a year. I almost forgot, I also have faith. Remember, I am an energizer bunny. It’s hard to keep us down. This entry was posted in Bucket List and tagged Back in the game, Backpack, Bear Container, Bucket List, California Lost Coast Trail, Dream, Energizer Bunny, Faith, Hope, Hope and faith, Life After Illness, Life Goal List, Retirement, The Next Big Thing by ckdenson. Bookmark the permalink.